Unlike all other Indian weddings, which are celebrated in a very elaborate manner, Kannada Weddings are a comparatively simple yet joyful affair. It is important to consider that there are different communities in Karnataka and there are some differences in the wedding rituals followed by each of them. Though in performance, all Kannada marriages resembles the traditional Hindu marriage. 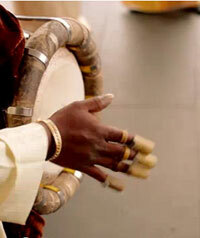 However, the customs and traditions performed do differ and vary according to the different regions in the state. Given below are the various wedding rituals of a traditional Kannada wedding. In a traditional Kannada Wedding, there are some very interesting rituals, which make the wedding a beautiful and enjoyable affair. Like all other Indian marriages, which are usually arranged marriages, a Kannada marriage also involves the same process of matrimony. After zeroing down to the most prospective matches, the alliance is formalized with a plate of betel leaves and supari. 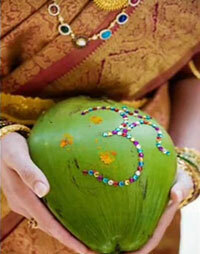 The parents of the groom visit the bride's home and gift her with a sari, blouse piece, coconut and fruits. In return, the girl's parents give the boy a dhoti, coconut and fruits. A priest is present there who all this while chants mantras. He also studies and matches the horoscopes of the boy and the girl to fix a suitable date and time of the wedding. 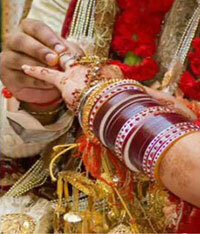 This ritual is practiced a few days before the wedding to ensure that the marriage is performed without any problems. A puja is performed with coconut, aarti and a kalash (copper pot). After that, the first invitation card is offered to God. On the wedding day, a havan is performed in the houses of the bride and the groom. During the marriage ceremony, the bride is supposed to wear Navari sari and green glass bangles with traditional gold jewelry. On the other hand, the bridegroom adorns a dhoti, angavastram and a pheta, a turban. The groom in his right hand holds a stick which has been sanctified in a holy place. After taking blessings from the elders, gods, goddesses in the house, the groom with his Barat proceeds towards the wedding venue. After the groom and his Barat reach the wedding venue, an arti is performed by the married women from the bride's side. Then, sumangalis (married women) lead the bridegroom inside the marriage hall. Ii is one of the most amusing rituals in the Kannada matrimony, wherein the groom pretends to leave for Kashi (taking up sanyas) as he is devoid of a suitable bride. He stops only when his maternal uncle shows him the bride chosen for him. Just before the groom gets ready to leave for the bride's village, all the items for marriage are placed in front of Lord Ganesha to seek his blessings. To commence the garlanding ceremony, the bride is escorted to the mandap by her uncles. After this a joyful ritual is performed, during which no one is supposed to see the bride's face. Her sister hides her face with a beautiful fan of peacock feathers. Both the bride and the groom stand on the each side of a white cloth, which separates them. After that, for the recital of the marriage mantras (Mangalashtam), the couple takes standing positions. The cloth between them is removed, and both of them garland each other amidst the chanting of mantras. During this ceremony, the bride's father gives away her daughter to the groom. He places the groom's hand on the bride's hand. This moment when the bride is "handed" over to the groom, her father pours water into the groom's hands (called dhara), signifying that she is now a part of his family. Then, before the seven phera, corn/rice is put into the havan for five times. The groom's angavastram and the bride's pallav are tied together into nuptial knot. The bride follows the groom seven times around the holy fire (saptapadi). Five sumanglis (married women) tie the mangalsutra around the bride's neck. The couple then bows before the elders and god to take their blessings for a happy marital life. D.Rama Rao-:The Wedding Planner is based in Tirumala(tirupati), and offers wedding planning services for all of India, with a special focus on tirupati tirumala devasthanam.